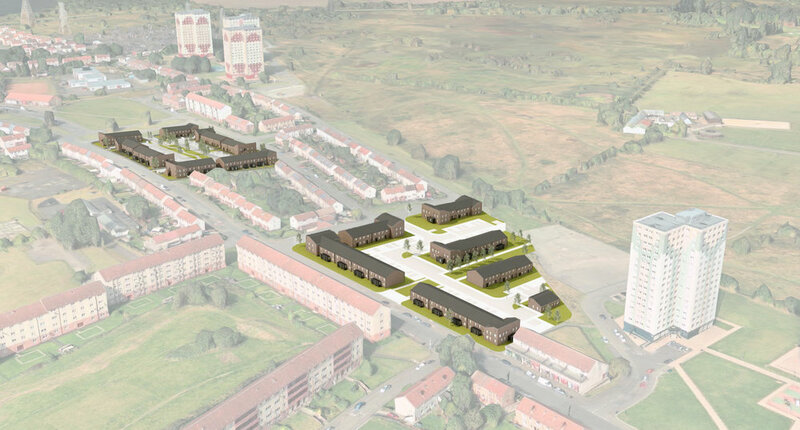 DO-Architecture on behalf of GHA/Wheatley Group have submitted planning permission for the erection of a 49-unit residential development, comprised of houses and cottage flats, in Milton, North Glasgow as a second phase to our Cathay Street project. Based on the Phase I development Cathay Street Phase II aims to further enhance Scaraway Street and Cathay Street using updated house typologies within a similar arrangement suited to the particular site and adjacent context. A strong streetscape along Scaraway Street is introduced with cottage flat bookends while a pedestrianised green space splitting the blocks encourages foot traffic through the site with future phases in mind. All parking for the development is located within the proposed rear courtyard space, off an adopted road, with no spaces being removed or reallocated from Scaraway Street.